The Center for Social Well Being organized the presentation of research and analytical results of professionals and graduate students involved in Participatory Action Research (PAR), for the joint conference of the Society for Applied Anthropology and the Society for Medical Anthropology held in Dallas, Texas, April 2004. Many of the panel members were participants in CSW’s 2002 and 2003 Ethnographic Field Methods programs in Peru, who are taking advantage of this opportunity to present their own field research conclusions. This collection of papers offers an array of perspectives on Participatory Action Research (PAR) that examine theoretical bases, as well as analyses of the application of the method in the field. Questions of the potential of PAR processes to effectively shift power relations and influence significant, lasting social change are discussed. Critical issues of the validity of PAR method, quality of data elicited, and the legitimacy of local knowledge generated, relevant to academic and non-academic research, are debated. Contributers are practicing anthropologists involved with the design, implementation and training of PAR; and also, graduate students with the social and political conscience to seek out collaborative investigative approaches carried out with communities of study to stimulate desired social change. This paper is the result of preliminary research done as part of a larger participatory action project exploring the lived experience of disability in urban Ecuador. Through an examination of narrative coupled with surveys about views on disability, the researchers have investigated how families with disabled children have navigated the existing “disability bureaucracy” and set up social support networks to receive benefits and services. This type of appreciative inquiry has uncovered the relevant issues about disability as well as made it possible for all stakeholders (school, families, community) to communicate their concerns through narrating their experience. This paper will show how narrative can be an effective tool in action research. Disagreement between curanderos and doctors in the Department of Ancash, Peru ranges from the seemingly mundane (the value of potatoes) to the critical (treatment of tuberculosis). Caught between the rival paradigms these specialists represent is a community with its own experiential knowledge of disease. This paper examines the potential of Participatory Action Research to create contexts for communication and mutual respect among health authorities that incorporate diverse voices of the community. In this way, PAR can lay the groundwork for an integrated approach to health issues at the local level. Title: The Academy and the People: Can the Two Co-exist? At the turn of the twenty-first century, in a time of immense global change, it has come to the attention of scholars that a transformation needs to occur within academia that addresses the gap between elite and everyday knowledge. What better a discipline then Anthropology to set this example — a discipline rooted in a profound love and curiosity for humankind. Yet there is surprising resistance and divide between scholars — those who work among the people, and those who feel there is no valid scholarship to be found outside the university. It is my intent to explore the relationship between traditional social scientists, and those who work in the applied field engaged in emancipatory approaches such as PAR, and why I believe the two should strive to work, learn, and liberate together. Title: Does the Researcher Have a Role in Participatory Action Research? This paper asserts that there are multiple critical roles for researchers in Participatory Action Research (PAR). I argue that researchers have access to resources and knowledge pathways that can be used to facilitate the transformation of knowledge-flow PAR seeks to create. In their capacity to bridge groups, bear witness to complex interrelationships, educate PAR practitioners and exercise political advocacy, researchers uniquely contribute to the process of valuing “bottom-up” knowledge. To illustrate some of the special contributions that researchers can make, I will discuss my experience with a video camera in Peru, PAR in the classroom, and my own work with a community coalition. This paper presents the process of a current PAR study, theoretically grounded in feminism and postmodernism, to assess the needs of Sudanese refugee women in a small city in Minnesota. This practice of PAR encourages cross-cultural knowledge sharing, while maintaining cultural integrity, and empowering women to shape skills for their new society. Through participation, group members demonstrate knowledge and create community representation, not only in the assessment, but in the resulting actions as well. Feminism and postmodernism have influenced much of academic anthropological thinking for the last 30 years. This investigation shows how PAR actualizes the best of feminist and postmodernist ideals. Historically anthropological fieldwork has relied heavily on participant observation as its methodological backbone. Indeed, most experimentation in anthropology is centered on theory and textual interpretation rather than methods. This paper examines Participatory Action Research (PAR) as the salient methodology that joins anthropology and advocacy. Today PAR is understood as a grassroots practice that works with, rather than on, people in a collaborative atmosphere. Moreover, PAR is an applied technique with a political conscience working for social change. 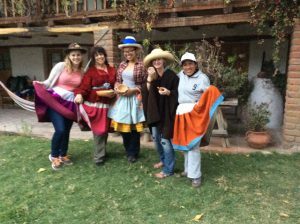 I will use three examples from a three week ethnographic field school at the Center for Social Well Being in the Callejón de Huaylas, Peru, as explanatory models to demonstrate different approaches to knowledge production. By focusing on these examples I hope to highlight PAR’s ability to incorporate a variety of voices as an effective tool to address ecological and equity issues.